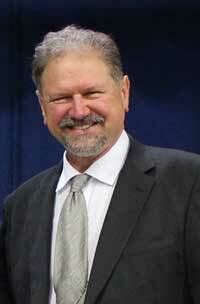 Randy Hylton, Executive Director of Vocational Services, has served with VSI for nearly 30 years. He began as facility manager in North Kansas City then helped open the non-profit agency's second sheltered workshop, a Liberty facility built in 1975. Hylton has led VSI to many new achievements. He directed the agency to its first national recognition by the Commission on Accreditation of Rehabilitation Facilities (CARF). The Arizona-based organization is considered the nation's leading accreditation agency for rehabilitation services. Hylton initiated VSI's Work and Personal Services (WPS), a unique program designed to help workers who are challenged to maintain state qualification levels for workshop employment. WPS has been studied by organizations across Missouri. In the core area of employment services, Vocational Services has dramatically expanded its supported employment opportunities which help create work opportunities with community businesses. From an initial group of six workers in 1992, VSI now operates the Northland's largest supported employment program with more than 70 employees in Clay and Platte counties. Workshop opportunities are a key employment focus. VSI's two workshops in Liberty and one in North Kansas City provide a solid array of business services for area firms needing packaging, sorting and assembly work. Seeing a need to expand those opportunities, Hylton in 1993 began VSI Pet Care Products which today sells first aid kits for horses and pets internationally. Other new services that help create opportunities include VSI PrintShop which supports services such as packaging and labeling as well as offering additional opportunities for attracting business customers. For information on VSI employment opportunities, go here.